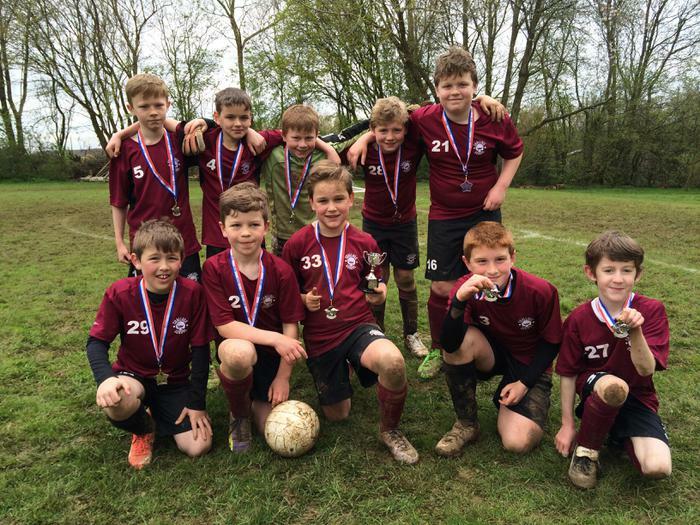 Following a 3-0 win vs Aldington in Thursday’s friendly, Challock’s Upper Junior team competed at the Ashford Medium Schools' Football Tournament on Saturday, 16th April. The last time we were here 2 years ago, the team reached the semi-finals, and after a strong opening in the group stages, hopes were high for meeting or even exceeding this achievement. The first game kicked-off at 9am, and Challock began well, taking a 1-0 lead through Joshua’s goal. However, Victoria Road were a strong outfit and scored two excellent goals, the second an unstoppable top corner effort from distance. Despite being down 2-1, Challock persevered and Joshua scored a second to end the game 2-2. Following this, Challock won 3-0 vs St. Michael’s, with Zach scoring a hat trick after being in goal for the first game, with Puck moving into goal. Throughout the tournament, Elliott, Freddy and Harry all played well in defence, intercepting well and being able to counter-attack swiftly. This defence proved crucial in the next game, a 1-0 win over a strong Hamstreet side who were vying with hosts St Theresa’s for the other semi-final spot from our group B. Challock finished with a 1-1 draw against St Theresa’s, last year’s joint-winners of this tournament, all the more pleasing that, despite going a goal down, Challock kept their heads up to not only equalise, but attack constantly – a draw was the least they deserved here. This meant that Challock went through as group winners, with 8 points (St Theresa’s and Hamstreet ended up with identical records, having then to play another 8 minute game which St Theresa’s won). Into the semi-finals, and Challock faced Phoenix, the runners-up from group A. Throughout the tournament, Sam and captain Jonny had played superbly on the wings, looking up to find Joshua and Zach with crosses that created chance after chance. George and Oliver proved to be real hounds in the midfield, taking away the time and space the opposition had on the ball, and Puck continued to play well in goal, providing huge kicks forward to turn defence into quick attack, and using his rugby skills to dive on the ball when needed. This semi-final was to be two 8-minute halves. Challock took a 1-0 lead going up the slope, but were pegged back by Phoenix to end the game 1-1. Extra time and golden goal loomed, and Challock, moving down the slope were the ones to score first, avoiding a penalty shoot-out and moving into the final! The final was held against last year’s other joint-winners – Mersham, who were yet to concede a goal, having won 4 out of 4 matches. They proved to be a tough outfit who looked very comfortable playing alongside each other. Challock created early chances, but conceded first from a goal line scrabble. Mersham then finished the first half strongly, scoring two quick-fire goals which knocked the stuffing out of Challock. They rallied well in the second half – the half-time chat was positive and Challock clearly didn’t give up. Mersham went on to score a fourth goal, but Challock finished strongly to get a goal back. The game ended 4-1 to Mersham. Challock played brilliantly throughout the tournament – many spectators and other team's coaches were really impressed with the way the players used each other, controlling the ball calmly, looking up to move the ball into space and create chances – they played mature and attractive football, and their runners-up medals were fully deserved. Well done to Jonny (captain), Sam, George, Freddy, Oliver, Puck, Harry, Zach, Elliott and Joshua.